The book adopts a critical cultural studies lens to explore the entanglement of government and gambling in everyday life. Its qualitative approach to gambling creates a new theoretical framework for understanding the most urgent questions raised by research and policy on gambling. In the past two decades, gambling industries have experienced exponential growth with annual global expenditure worth approximately 300 billion dollars. Yet most academic research on gambling is concentrated on problem gambling and conducted within the psychological sciences. 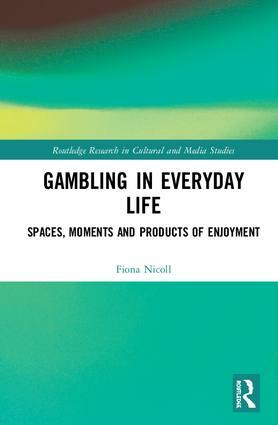 Nicoll considers gambling at a moment when its integration within everyday cultural spaces, moments, and products is unprecedented. This is the first interdisciplinary cultural study of gambling in everyday life and develops critical and empirical methods that capture the ubiquitous presence of gambling in work, investment and play. This book also contributes to the growing cultural studies literature on video and mobile gaming. In addition to original case studies of gambling moments and spaces, in-depth interviews and participant observations provide readers with an insider’s view of gambling. Advanced students of sociology, cultural theory, and political science, academic researchers in the field of gambling studies will find this an original and useful text for understanding the cultural and political work of gambling industries in liberal societies. Gambling in Everyday Life: Signposts in the Literature …………. Finopower: Transforming Intersections between Gambling, Finance, Work and Play …………………………………………………………………. Gambling beyond the Zone: Enjoyment in Everyday Life …. Statey Spaces of Gambling ……………………………………. The ‘Pokie Lounge as an everyday cultural space of gambling . Strategies and tactics in the Pokie Lounge ……………………. Gender, Time and Gambling in Everyday Life ……. A Sporting Chance: Gambling at Work………………………………. National Gambling Moments: Melbourne Cup Day Celebrations……. Are EGMs Gambling Products? …………………………………..
Sacrifice and Scapegoating: Problem Gambling and Finopower …………. Extractive Industries and the Constitutional Grounds of Liberal Democracy …. Dr Fiona Nicoll is an Associate Professor at the University of Alberta where she holds a research chair in gambling policy in the Department of Political Science. The author of Diggers to Drag Queens: Configurations of Twentieth Century National Identity (Pluto Press, 2001) and founding member of the Australian Critical Race and Whiteness Studies Association, she is co-editor of Transnational Whiteness Matters (Lexington Press, 2008) and Courting Blakness: Recalibrating Knowledge in the Sandstone University (University of Queensland Press, 2015).